Dear, oh dear, oh dear. Which rules to choose? Not really a problem for my WW2 games. I have been playing WW2 for more than 30 years so I know a good set when it comes up - hence I have settled on Blitzkrieg Commander. But the Seven Years War is a project of only two and a half years duration, and I still seem to be finding my feet. I started with Standing Like A Wall, the downloadable rules by Ioannis Mavromichalis (of Leuthen Journal fame), but they barely got a look in before I discovered Minden Rose, an excellent set which I was fortunate enough to be introduced to by the author (Barry Lee). At the same time, I was dabbling with Donald Featherstone's horse and musket rules, which then got me started developing a set of my own derived from these, as a bit of a side project. Then along came Die Kriegskunst, which I bought but never played as I could see straight away they were a little too complex for my taste. And then before I knew it, Rank and File were being released. Minden Rose is hardly a complicated set (and I would recommend them to anyone), but R & F was even quicker and simpler to play whilst retaining all the period feel I felt I needed. This was all good, then. I was happy to carry on with Rank and File as my standard set. The Featherstonian project was abandoned. But then I started to hear about a new rule book called Black Powder. Really quick and fun games, and based on the Warmaster system which I liked so much when adapted for WW2 in Blitzkrieg Commander. And the guy who wrote Black Powder was the guy who had originally developed Warmaster. Crikey! However, reading various pieces and discussions on the net, I quickly got the impression that the rules were designed for gaming on enormous tables with at least 3 players each side, and that the authors had some weird fantasy that they were Edwardian gentlemen. Plus the rules were apparently a sort of coffee table book that cost 30 quid. Well, I wasn't having any of that sort of nonsense. So I went off Black Powder and vowed to ignore these foolish people. But they wouldn't go away. BP was authored and backed by some prominent names in miniatures wargaming, people who knew a bit about production values and PR. In the modest world of horse and musket wargaming, Black Powder was quickly established as something of an event. And almost every comment I read from those who had played them was positive. So, with a resigned sigh, I went on Amazon. There, I was lucky enough to find that I could pick up the rules for a shade under £18, including p & p. Oh alright then. I sent off for a copy. That was a couple of weeks and two solo trial games ago. So here are my personal impressions of Black Powder. 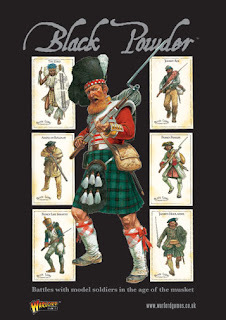 Every other bugger on the net with an 18th or 19th century army is writing reviews of BP - so why not me? As everyone knows, the production values of this rule book are very high. It is indeed a very slick commercial product. I acknowledge this aspect of BP is very attractive to most purchasers, but just to be contrary I will make a few personal comments. The photos are of a high quality, featuring beautifully painted figures, but mostly these figures feature in carefully posed dioramas rather than real games. I am not fundamentally a modeller or a creator of dioramas, I am a wargamer, so I find I am not particularly inspired by these photos. I would have preferred photos that gave me examples of different layouts and types of terrain, or that illustrated the rules. Nice. However, my overall impression was that this publication takes the creation of an attractive product a bit too far. One hundred pages (in round figures) to describe what are fundamentally a simple set of rules is rather excessive, a page count fluffed up with large photos mostly not of actual games, side bars of period quotes and (notwithstanding the above) a rather long winded writing style. The main problem is not that this all increases cost (although it does), but that it makes the rules harder to get to grips with when first getting to know them, and makes the rules harder to look up when you are learning in your first few games. I am in favour of nicely produced rule sets, but one has to maintain a sense of what is appropriate. Perhaps a good alternative might have been a concise exposition of the rules in a discrete section with all the chat, explanation and rationalisations forming the rest of the book. I would take comments that this is a book about wargaming which includes a set of rules with a pinch of salt. This is fundamentally a rule book: it lays out a set of rules by which to play wargames. Hence my comments above regarding excessive length. Having said this, it follows that the rules are the essential grounds on which the book must be judged - and I found them very attractive. In simplicity and ease of play, they don't have much advantage over Rank and File, but the command system provides a game which can be dramatic, surprising and a lot of fun, and the rules for morale up to brigade and army level create a game that will come to a proper conclusion in a reasonable time (i.e. an evening's play). Setting aside my preference for a more concise style, the rules are well explained and generally easily understood. I have played 2 solo run-throughs with around a dozen units per side. The first was a bit of a trial to begin with, due to the sheer number of pages to be rifled through when you want to look up a procedure, but by the middle of the second game I was away. If you played these rules for the first time with someone who already knew them, you would be in the groove very quickly. Dreyse vs. Chassepot is a basic tactical factor for anyone gaming the Franco-Prussian war. With 180 pages to play with, such issues deserve a bit of attention. One is left with the impression that the authors simply couldn't be bothered. Another reservation concerns unit stats and the special rules that can be applied to give units a particular character. There are 24 of the latter. With a unit already having 4 basic stats to define its abilities (shooting, hand-to-hand, morale and stamina), I feel that that should have been enough. Adding the special rules creates a kind of Lord of the Rings feel, where each unit becomes the equivalent of a character in a skirmish game. Then you spend half your time trying to remember which special rules apply to which unit and then remembering what those special rules actually entail - with the high probability that you will forget all about some of the special rules until after the game. Suffice to say I reckon a lot of these special rules (or 'useful' rules as they are also described) are rather superfluous, and they are best used with considerable circumspection. Here again, I have read online comments describing how much some players enjoy tailoring their units to a particular battle or campaign by using the special rules. Fair enough. But in a simple game, for me they are just over-egging the pudding. The rules did give me the impression that luck with the dice was even more important in BP than it is in other sets. I think in particular it's the all-important Break Tests, which use 2D6 and hence have a very wide set of possible outcomes. However, I'm no game designer and my experience of the rules is limited, so this is something I will keep an eye on rather a criticism. However, my final point is linked to this latter feeling about BP. I am intending to game the Battle of Lobositz (1756) in the near future, as I have found my relatively meagre forces can be stretched to give a reasonable representation of this battle. But something is telling me I would be better off using Rank and File than Black Powder for this refight. Maybe BP would provide too volatile and unpredictable a game for a re-run of a real battle, and a more traditional, predictable set would be better. I don't know. With luck I'll be able to try it both ways. My personal take, then, is straightforward: an excellent set of rules in a rather over-produced rule book. I'm glad I bought them. If your preference is for the simple and fun game, these are the rules for you. But get on Amazon and check out the latest deals - paying Warlord Games or any of their agents the full £30 is just daft. With the fluff reduced, these rules should have sold for £20, and that is what you should try and pay. P.S. - QR and Roster sheets. You can download these for free from Warlord games. However, a wargamer going by the name 'The Last Hussar' has developed QR and Roster sheets in black and white so you can save on coloured ink over printing out full colour pages. More significantly, you can type your units into the Last Hussar's rosters, rather than having to print out a roster then hand write the details. Much easier and looks better. Despite being black and white these alternatives are still stylish. Recommended. See the link to the Last Hussar's Barracks, then look out for the post on Black Powder QR sheets and Rosters. Excellent review! It's good to hear about some of the "downsides", as well as some comparisons to other rulessets. Nicely done! Thanks! DC - you are fortunate that there are a wide number of opinions out there on BP, so by pottering around the net you can compare different views, many of which would disagree with mine. I got mine for £15 +£2.95 p&p from Amazon. I agree with the fact that there should have been more guidance on which rules for which periods. The one I am struggling with is 'Mixed' formation - is it still relevent to FPW/ACW? At times it feels Napoleonic/SYW and stretched in both directions. I've played one game, (napoleonic), which seemed to work quite well. You'll see in this I give the Chassepot a 48 range. I enjoyed your review, level and fair. having perused other parts of your blog, I like your practical nature. I am often limited by financial realities these days. Thanks Steve for the review, it very much mirrored my experience with BP using 15mm figures. I played one game (Queenston Heights 1812) with a friend who knew the rules that went very well other than sometimes forgetting the special abilities. Then I tried to run a second game on my own (Lundy's Lane 1814) with a group of newbies and it was a disaster, we made many mistakes mainly because of the difficulty in finding the actual rules amidst all the wordy prose (the free only QR sheet helped a little). 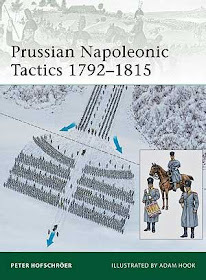 I will try them again as I think there may be a good set of rules buried in all the fluff and I am trying to find a good set of rules for the War of 1812. I do like the flexibility for example you can change the figure numbers for the unit size to fit your collections basing style and number of figures. For example my “standard unit” will be changed from 24-30 to 12 to 20 figures. Just wish someone would produce a streamlined version of the rules without all the fluff. Nice review. I've been playing the game for over a year now. I'd pick out 2 points form your review - ones that worried me at first. Special rules:I instinctively dislike such things, however they seem to work well when used sparingly. Keep most units "vanilla" with special rules for a few elites - or a consistent special rule for particularly effective armies. Lack of specifics: I think the writers know wargamers pretty well. They could have provided another book full of specific rules and ranges fo obscure kit (Russian against swedish pikes - shuvalov howitzers, grasshopper guns, volley guns. But what would wargamers do - go online and argue about the details. INstead they've taken the view that "If you guys know better, just change it". Of course this leads to 1000 varieties all going under the Black Powder label. I hope it will avoid the regular revisions as we've seen with WRG and Games Workshop. The biggest hope is that the game provides happy players. I'm quite satisfied on that count. It's interesting - this 4 year old post continues to generate considerable interest. I continue to believe that BP are a good set of rules. I do however agree about different rule sets for different periods. I like each of my wargame periods to feel distinct and different, and I want the rules I am using to be designed specifically for each period. Otherwise, as you say, it can feel as if you're playing the same game, just with different figures. I wish I would have read this post when I set out to purchase Black Powder! I like the rules but I find I have some problems reconciling the things I can't figure out from the rule book. I asked a particular question on the Warlord forum and received "yeah, that sounds good to me" from other players but no definite answer. While I've only played it a handful of times, I have really enjoyed Rank & File as a rules set and will dust them off and give them a go soon. I know this is a reply to a really old post but the review and comments are still relevant. Thanks for a good review - you put your finger on all the points that bug me about BP. Having said that, we have had many entertaining big Napoleonic games with them and one miserable small ACW game. If I can be cynical for a second, the reason there is so little period adaptations given in the BP rulebook is so they can sell you the supplements! Its not that they can't be bothered. The supplements are also very fluffy with the actual period adaptations limited to 2 pages or so although they do give unit stats for the different conflicts and a number of scenarios. The fluffiness of BP became so annoying for us that I developed "Black Powder Light" which is what we now use. I have yet to try BP for 7YW using the "Last argument of Kings" supplement which I just bought. I have also used your HoW rules but never "Rank and File". Where can I get these? Hi Richard. I think our assessments of BP supplements coincide! If you haven't found it already, search 'Keith's Wargaming Blog Last Argument of Kings' for my take on the 18th century supplement. 'Rank and File' is still available from the Crusader Publishing site, along with some useful pdf downloads. A good set of rules, IMHO.